During the long, dark hours of winter my childhood hobby still consumes my time. Crocheting with thread has been my passion for almost half a century. There isn’t much of a market for lace crocheted doilies though. 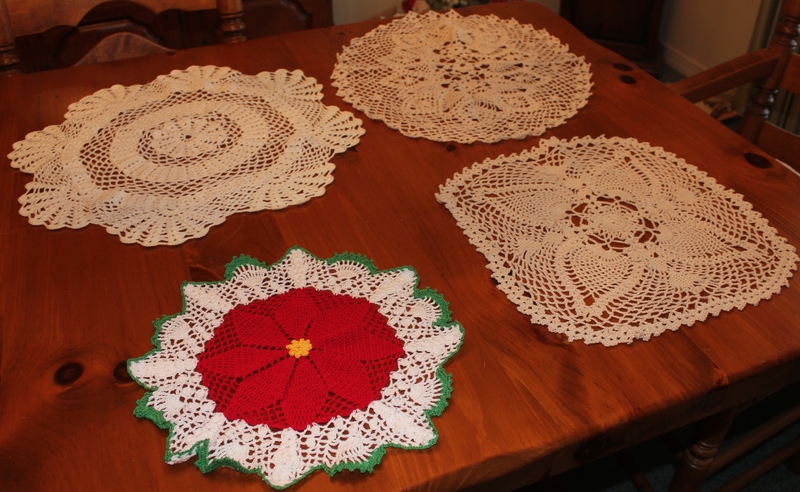 I recently combined all my projects together and found almost fifty items, from doilies to soap covers, a bikini top and tiny unfinished bottom, to pot holders, as well as lace collars that were fashionable for a brief time. So why spend hours making an item that has no purpose, no marketability? Crocheting lace items with size ten cotton thread gives me a link to my past. My maternal grandmother, Ada, taught me to crochet when I was in high school. She was the favorite person in my life, a strong-minded feisty strawberry blond, who believed strongly in marriage, family and God. She sewed and crocheted her entire life. When she was strapped for cash in her senior years she bought sea shells and made earrings, pins, decorated plates and little shell-covered knickknacks, successfully selling them for “pin” money. Her hands were always busy. She was my hero. 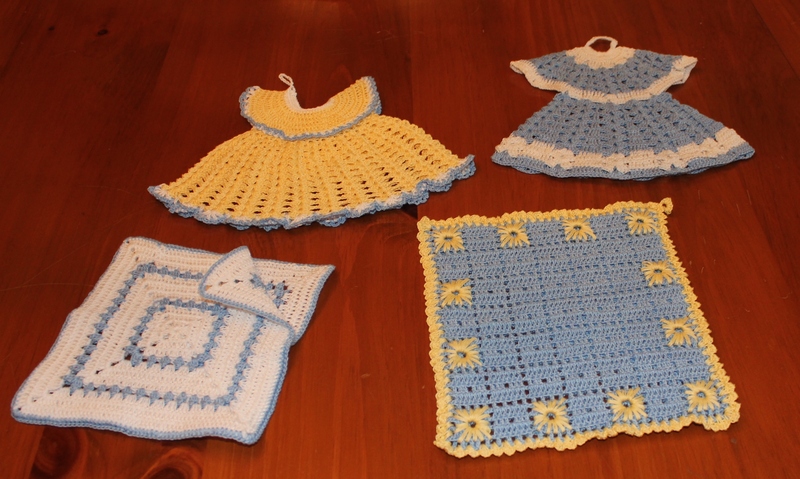 It’s only natural that I would follow her life-long passion for crocheting and hand-made items. In 1999 I had a much-needed hysterectomy. On the one hand I was happy to have as much as eight weeks off work. In reality, when recovering from surgery it translates into hours of boredom, and inactivity, all dressed up and unable to go anywhere. 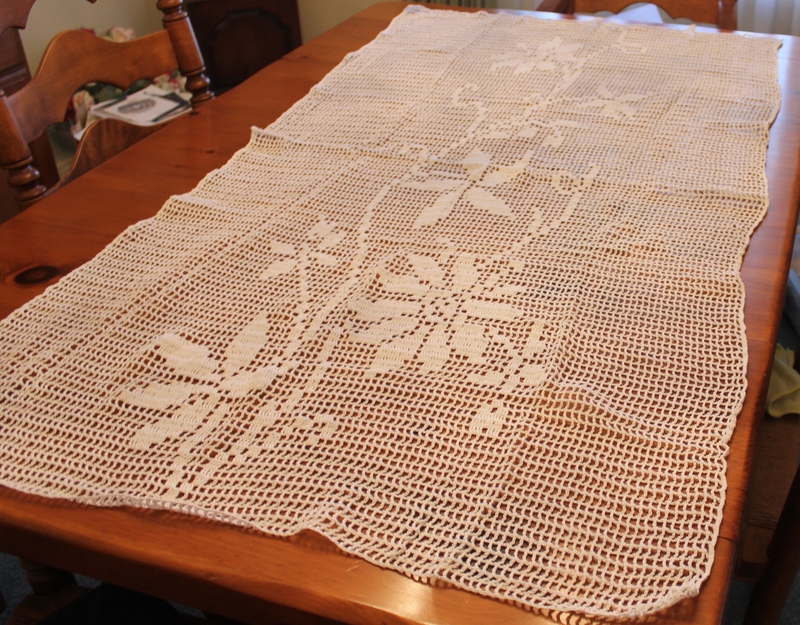 The crocheted tablecloth I made is the result of three weeks of boredom. When the tablecloth was finished I returned to work early to get on with life. When I die the story that goes along with this project will be lost. In fact, when I pass on, this is part of my legacy that I will leave behind, a pile of doilies of different colors and sizes. Each doily has a story about a certain time in my life. But most of all it translates into hours of relaxation, a time of meditation and peace. Until I die or until, like my Grandma and Mom, my brain possibly succumbs to Alzheimer’s, more doilies will be added to those displayed on the dining room table. Perhaps someday someone will touch them and wonder about the person who crafted the intricate designs. Or maybe in the future hand crafted items will be worth a small fortune, telling the story of a period when people had leisure time and weren’t scrambling to put food on the table. A friend recently asked if I’d sell some of the pot holders. There has never been an interest in my lace doilies. The few times I’ve given them as gifts I saw a look of dismay on the recipient’s face, as if I’ve given them a Chia pet or an antique. Doilies are a relic from the past. It appears to me that they have no economic value, replaced by cheap Made in China lookalikes, which is sad. But that doesn’t stop me. I crochet to relax, to keep my hands busy. Between crocheting and beading my mind works hard to understand written patterns, a good mental exercise. Sell them? That would be a hoot. But who can put a dollar amount on the hours of time it takes to make each item? How can I give up something I’ve spent hours crafting? How do artists feel about selling pictures that they’ve put their heart and souls into? Ah, there’s no comparison. Doilies are dust collectors, unless they are framed and displayed, which has crossed my mind. 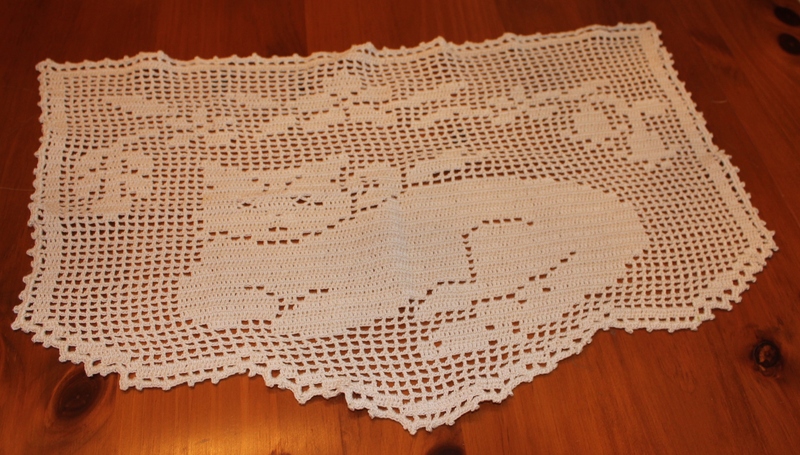 Did you notice the filet crocheted cat doily? That is from an old Woman’s Day or Family Circle magazine from decades ago. I think I’ve made three. Now that pattern I’d like to make again and frame. When was the last time you saw crocheted or knitted patterns in those magazines? Times have changed. None of my doilies are starched or blocked, although I have recently finished three Sun Catchers and need to starch them and attach them to large metal rings to display in the dog training building’s windows. But right now I’m making pot holders. If nothing else, the crocheted, sometimes multi-colored holders look nice displayed on magnets on the refrigerator, conversation pieces. If anyone asks, I can tell them about my awesome Grandma Ada, who inspired me to be creative every day, who is no doubt, the reason I have a bit of a feisty spirit in me too. This entry was posted in Alzheimer's, Cats, Crocheted doilies, Crocheting, memories, Retirement Life and tagged Cat, Crafts, crochet, retired life. Bookmark the permalink.